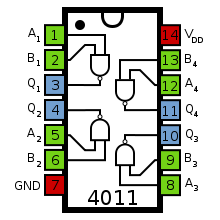 The truth table for one of the four gates is shown to the right. For more information about the NAND gate in general, see this module. This chip is widely available, and usually comes in a DIL-14 or SOIC-14 package. This chip is different in pinout to the TTL 7400, but can fulfill its function if the wiring is modified. This page was last edited on 20 February 2017, at 19:32.